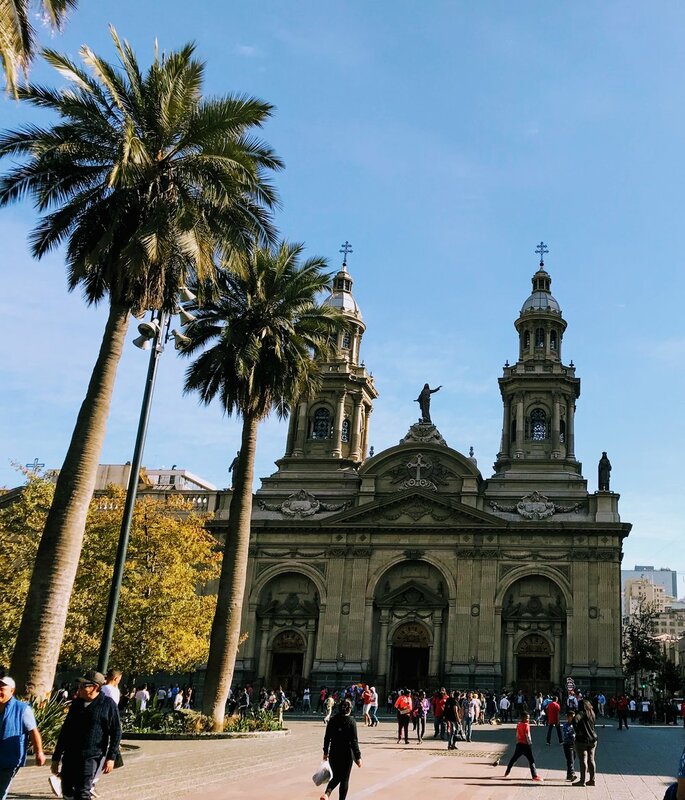 One of the perks of living in Santiago is that it has a number of “Free Walking Tour” companies, which is an inexpensive way to learn about the city. We tried out Free Walking Tours earlier this month, so I wanted to share some highlights of our experience. If you find yourself in Santiago, and have half a day to walk around, you should try this out. Our meeting point was at the iconic Plaza de Armas in what’s considered the “Centro” ie downtown Santiago. We walked around to the major government buildings and museums in the area, and got to take some beautiful photos of these historic buildings. Interested in learning more about Santiago’s Neighborhoods? #FACT: You’ll find a Plaza de Armas in every major Latin American city. Historically, these central plazas stored the city’s weaponry, so if there was a battle about to break out, the residents were instructed to make it to their local Plaza de Armas and arm themselves appropriately. These days, Santiago’s Plaza de Armas is a crazy mishmash of vendors, including the famous completo stands. At the Palacio la Moneda (the Government House) we took a break to learn about Chile's key political figures in its recent past. Socialist Democrat Salvador Allende was elected to become the President in 1970, and promised to improve the lives of thousands of impoverished Chileans. He adopted a policy of nationalization and collectivization, which eventually led to an economic crisis in the country. 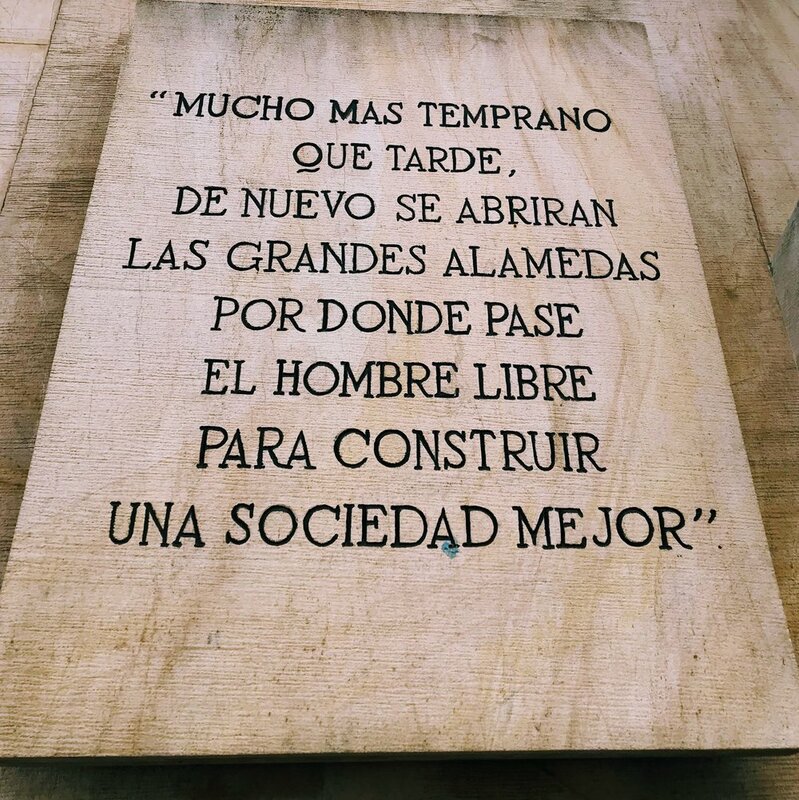 This roughly translates to: Sooner or later, the great avenues will be opened again so that free men can create a better society. In 1973, Allende was ousted by Augusto Pinochet in a violent military coup that led to Allende’s suicide (all supported by the good ole USA). Pinochet’s dictatorship lasted for about 20 years, and included the persecution of numerous dissidents via kidnapping, torture and death. 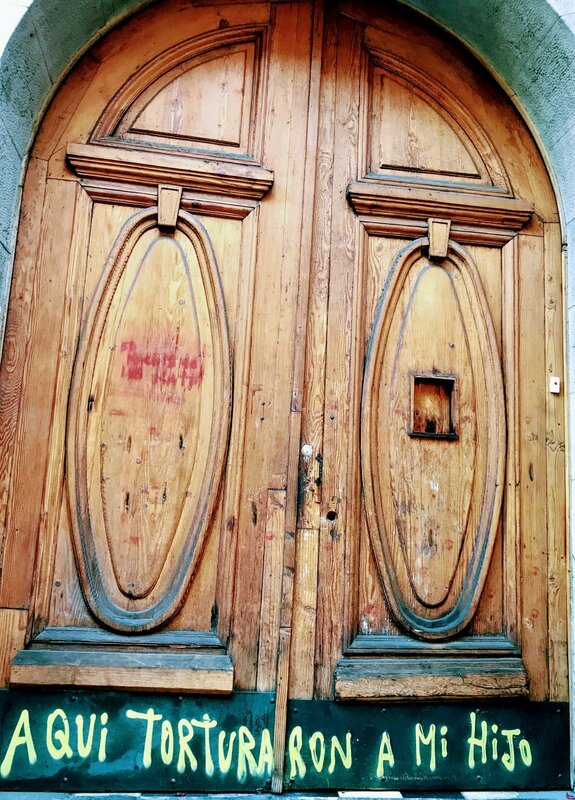 Located at Londres 38 in the Paris-Londres neighborhood, this was one of Pinochet's torture chambers. #FACT: I had always assumed Pinochet was regarded poorly by Chileans, since I only knew about the dark side of the dictatorship. What I didn’t realize, however, is that there is a large contingent of Chileans (many of them wealthy) who revere Pinochet and herald his policies. Under his reign, the country improved its infrastructure, introduced privatization, and the economy soared. What’s more, the torture and killings of Pinochet’s government is rarely discussed, and still not learned about in schools! Que raro. Moving on to more positive landmarks, we explored Santiago’s very own Wallstreet, which houses the local stock exchange (street name: Nueva York). I also found out about the iconic Barrio Paris Londres neighborhood, which was designed by European architects. We also visited the oldest church in Chile, Iglesia de San Francisco, which has been standing here since the 16th century. It was probably my favorite part of the tour, and the most beautiful church I’ve visited. For lunch, we gathered our group in Barrio Lastarria, which is the neighborhood we live in! The tour guide showed us photos of what Cerro Santa Lucia and some of the other main roads used to look like. Pretty wild to see what old Santiago used to look like! Also, we tried churros (#NeverNotEating). 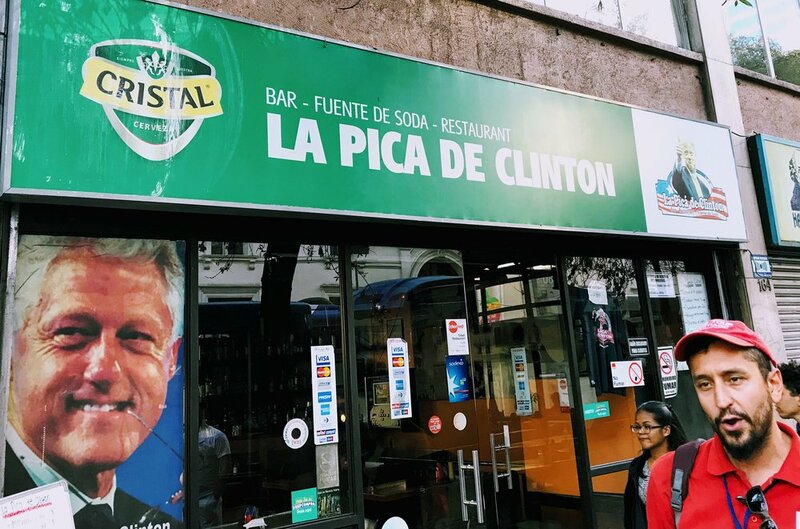 #FACT: Make sure you visit the restaurant Pica del Clinton. It’s named in honor of Bill Clinton, because he visited once, and ordered a Diet Coke. The owner couldn’t get over the fact that a US president visited his restaurant, so he proceeded to adorn the ENTIRE place with Clinton memorabilia. It’s really weird, but worth a walk by to witness it for yourself. Four hours into the walk, we reached our final destination. Pablo Neruda’s home is called La Chascona, and designed to look like the sea (ironic since he never learned how to swim). I wish I had something more interesting to share here, but I was tired and was half listening. #FACT: The pollution in Santiago is so bad that it’s like smoking 8 cigarettes a day. Turns out, this city isn’t even the worst offender; New York’s pollution is worse. Cheers to our health! I was told that there are much better free tours in Santiago, so I’m making it my mission to check out all of them. Let's do one together when you visit me! INTERESTED IN CHECKING OUT SANTIAGO?